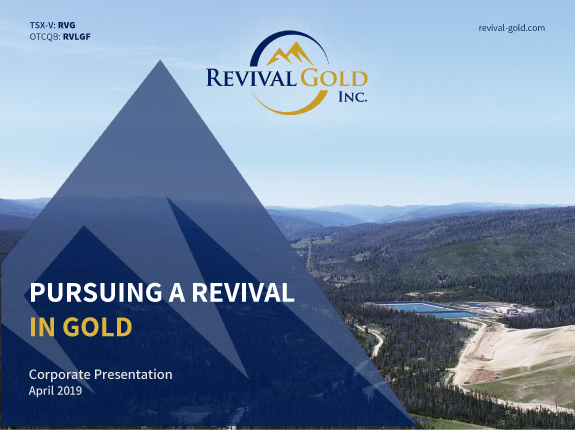 Revival Gold 2018 Year in Review - Revival Gold Inc.
Toronto, ON – December 27th, 2018 – Revival Gold Inc. (TSXV: RVG, OTCQB: RVLGF) (“Revival Gold” or the “Company”), a growth-focused gold exploration and development company, provides a summary of the Company’s key 2018 accomplishments. Established a significant maiden gold resource – total indicated mineral resources of 33.4 million tonnes at 1.13 g/t Au containing 1,214,000 ounces gold and total inferred mineral resources of 16.9 million tonnes at 1.41 g/t Au containing 765,000 ounces gold (the “Mineral Resource”). See “Mineral Resource Estimate, Beartrack Property, Lemhi County, Idaho, United States”, dated July 12th, 2018, for further details. Completed 8,500 meters of drilling – 7,600-meter core drill program at Beartrack extended the mineralized trend to 950 meters south of the existing Mineral Resource. Initial 900-metre core drill program at the neighbouring Arnett gold project confirmed presence of near-surface gold in oxides. Received positive initial metallurgical test results – initial six Beartrack sulphide composite samples returned favourable gold recoveries into rougher flotation concentrate and from cyanidation of flotation tails. Expanded land position – increasing the Company’s total land package at Beartrack-Arnett to approximately 5,100 hectares. Strengthened team – appointed Diane Garrett as Non-Executive Board Chairman and engaged Rodney Cooper as Technical Advisor and to assist evaluating corporate development opportunities. “In 2018 we announced a significant maiden gold resource at Beartrack”, said Hugh Agro, President and CEO. “We followed up by extending the mineralized trend at Beartrack and confirming the presence of near-surface oxides at Arnett providing clear scope for continued organic growth in 2019. Additionally, Revival Gold has taken steps to strengthen it’s team in preparation for a landscape in which demand for quality new gold production opportunities is heating up and supply remains scarce”.